New images of Sony Ericsson's next mini-mobile, the successor to the X10 Mini Pro, have surfaced on the internet, and show the company adhering to the mantra "If it ain't broke, don't fix it." The design is very much the same as the original Sony Ericsson X10 Mini Pro, with rounded corners, a slide-out QWERTY keyboard and a diminuitive form-factor. The new photos seem to be a more polished version of the same handset we saw leak in January, but this time the tipster has managed to switch it on. What's new then? 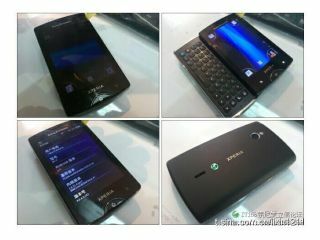 Well the surprisingly high quality spy shots show the handset running Android 2.3. And, well, that seems to be it. Still present is the 'corners' UI – whereby each corner of the touchscreen has a set shortcut. The January leak offered more detail, although we can't vouch for its accuracy: 1GHz Qualcomm processor, Adreno 205 GPU and a 3-inch screen. A 3-inch screen would make it half an inch larger than the previous iteration and the photos do make the handset look a little longer and sleeker than the current X10 Mini Pro. Speculate all you want, but with what looks like a fairly polished handset under wraps it shouldn't be too long before Sony Ericsson unleashes the tiny terror.